In March, it was announced that Wheelman would get a facelift. 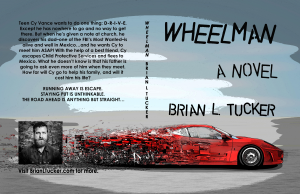 Today, I shared the NEW Wheelman cover on Facebook, Twitter, Instagram. But, I also wanted to share a brand new image I received from my publisher for my newest work, Swimming the Echo, which launches this month (5.30.17) with eLectio Publishing! The image for Swimming the Echo will be shared online at 4pm today. I hope you are as excited as I am. These works of fiction are something I look forward to sharing with you. Currently, Wheelman and Baptisms & Dogs: Stories are both available as Kindle ebooks for $5 total! Share the love. Take a book on vacation.